Nestled in the Tasmania’s North is Heidi Farm – a magical place where milk from neighbouring dairy farms is used to create award-winning Swiss Cheese varieties using traditional methods. Heidi Farm’s authentic farmhouse cheeses are hand crafted following traditional cheese making techniques and produced free of calf rennet. The art of cheesemaking is something that is honoured at Heidi Farm. Fresh, quality milk generated from the best dairy farmers in the northern Tasmanian region is first tested for its butterfat and protein content. Before the cheese making commences, the milk must be standardised and pasteurised. After the starter culture is added and the curds and whey separated and heated, the curd is then shaped into the wheels, pressed and drained, salted and finally, matured. The length of time for maturation determines the unique flavour of the particular cheese varieties. This process takes place in a carefully controlled environment with regulated temperature and humidity conditions. In addition to this production process, Heidi Farm cheeses are crafted with the skill, passion and intuition of their dutiful cheese makers, so that each cheese is brought to its full flavour potential and provides a rewarding cheese experience. Heidi Farm cheeses are only ever produced in the most ideal circumstances. When seasonal changes affect the quality of milk (such as in winter), production ceases, ensuring the highest quality of cheese is maintained. Heidi Farm Raclette, Australia’s most awarded cheese, presents an intense perfume and a mild nutty, milky flavour. The rind of the cheese is washed and scrubbed during production, promoting flavour development and ripening. The supple, satiny interior of this multiple Australian Grand Champion Cheese is best appreciated when the cheese is melted or cooked. Traditionally Raclette is melted on a raclette burner, scraped and eaten with boiled waxy potatoes and pickles. Tilsit is a sumptuous cheese with a rich, dense texture and distinctive nutty overtone. It makes for a fabulous table cheese and is regularly enjoyed according to European tradition – eaten with bread at breakfast time. Tilsit is also widely used in sauces and vegetable dishes and is perfect for grilling and melting. 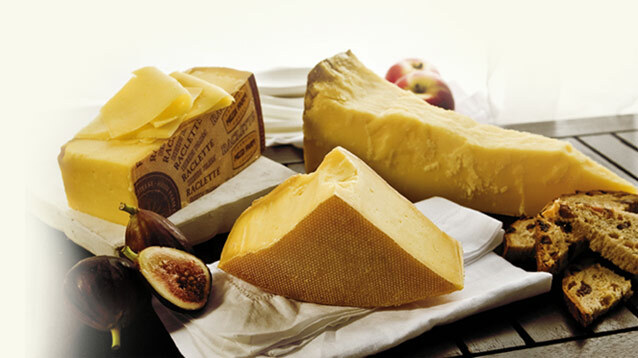 Gruyere, with its abundance of industry awards, is considered a benchmark and one of the finest farmhouse cheeses to be produced in Australia. Crafted by hand to a traditional technique using milk from neighbouring farms, this classic Gruyere is wonderfully smooth and nutty in flavour and offers a strong aroma. Because of its quality melting properties and great texture, Heidi Farm Gruyere is a wonderful cheese for cooking – perfect for grilling or using in a fondue, soufflé or quiche. Aged Gruyere is matured for 18 months in order to produce a concentrated flavour that has an underlying creaminess and intense nuttiness along with a flaky texture. The large 25 kg wheels have a natural brown rind that provides a strong aroma which is derived from the long maturation process. To find out more about the story of how Heidi Farm came about and it’s founders, here is a great article, featured in Regional Food. Head into our stores at Salamanca Fresh and discover the unique farm house flavours that theese cheeses offer.